My now annual trek across the Yarra to Albert Park for the Brazillian Butterfly Queen of the Lake fun run for Ovarian Cancer ended much like the last one did – me dragging my hot, sweaty, self-satisfied body to the Old Paper Shop Deli for a Ms Sourdough sponsored breakfast. I again had the company of a much fitter, less sweaty Baby Chino and was happy to include newcomers to the support of this worthy cause, Lord and Lady Marmalade. Prunes! Well, one prune. There were more but I was so excited by this muesli to stop to take a photo of the undisturbed dish. I cannot go past a breakfast that includes this most sticky sweet digestive. Imagine if bran was also an ingredient here, my gastrointestinal tract quivers at the thought. Anyway, prunes alone were my reason to revisit this muesli as I would like to reiterate how great they are. 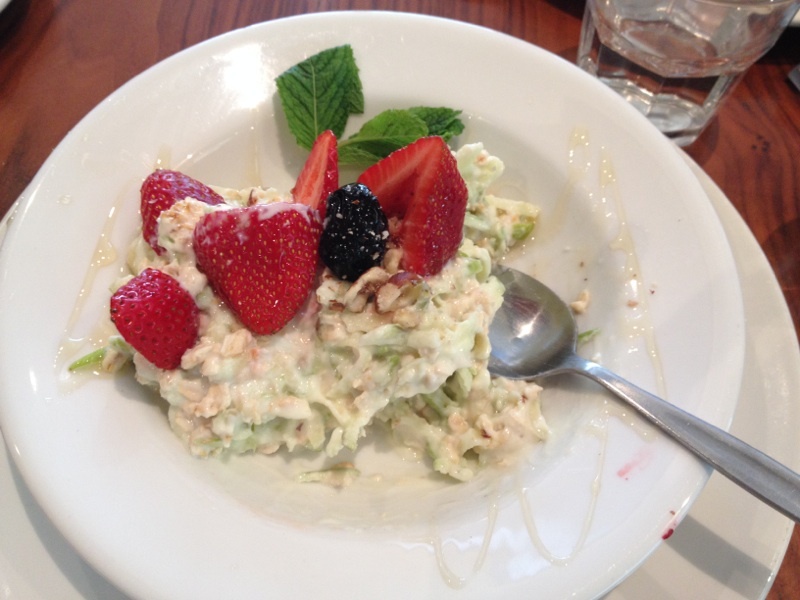 The muesli here has not changed one bit – still refreshing with cool grated apple and natural yoghurt. The hazelnuts add a dessert-like flavour, recalling cakes and crumbles – things that the Old Paper Shop Deli has in delicious-looking spades. There was even the silly mint garnish that I came across one year ago but this time I will pay it the respect it deserves as it put a furry little mint tinge to the underlying yoghurt, which is much more appetising than I’m making it sound. Again, I could have eaten two serves of this muesli, but that is probably because running around Albret Park Lake in 32 degree heat will make a girl extra hungry. 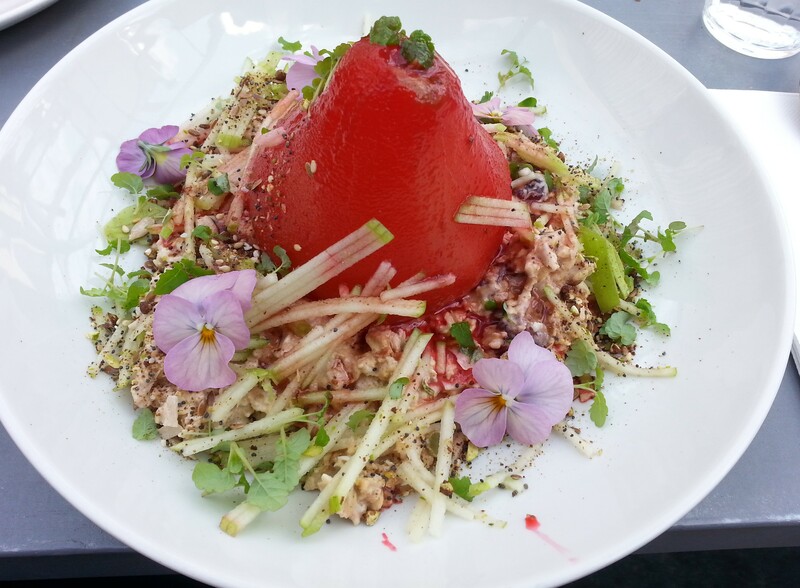 Final Word: The Old Paper Shop Deli muesli is a good second reason to be in South Melbourne. The first reason should be something charitable and fun, and not awful like the Grand Prix or Chapel Street. Last Sunday morning I found myself in South Melbourne. I know how I got there – this isn’t one of those stories – it was in the course of doing a fun-run around Albert Park in aid of ovarian cancer research. And what better way to celebrate running 5km than a high-society bowl of muesli? Yes, I’ll launch right into it: being a Northern suburbs Miss I have an innate wariness of the land over the bridge(s) so get ready for lots of “South-side” this and “snooty” that. That’s how I was brought up, I suppose. The Old Paper Shop Deli is, according to Ms SourDough who was one of my company on this occasion, a South Melbourne institution. It is located just North of the corner of Clarendon and Dorcas (malorcas) streets and is pretty un-inspriring in terms of its interior. That is, until the hungry eye rests upon the selection of cakes – which almost made me consider breaking my “cereal is breakfast, cake is not” rule. Almost, but I’m occasionally practising self control these days. I’ll be honest, I’m paraphrasing again because I had to order for my two breakfast companions which was easy due to endorphins and their memory-enhancing properties. In fact, the only thing that was not enhanced that morning was my appearance, which was decidedly dishevelled and a bit damp. Lucky there were no paparazzi about. 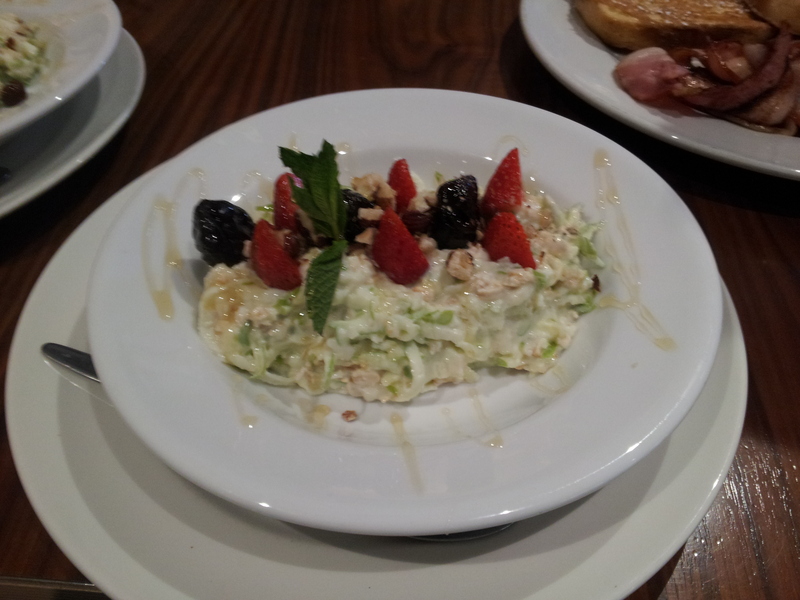 You know you are on the wrong side of town (that’s right, the South side) when your muesli comes with a mint garnish! Despite this, the dish was glorious. Firstly, it was cold which is the sort of refreshment I am after when I eat any sort of dairy product (except tasty cheese, which is best melted). Honey was drizzled on top giving it an initial sweetness that was not overbearing and happily diminished as I made my way through the meal. The real revelations here, however, were the fruit and nuts. Call me old-fashioned, but I love a good prune and this meal had at least three of them which added a soft, waxy texture that was truly lovely. Additionally there was a very high density of freshly-grated, cold granny smith apple throughout the muesli that added a welcome crunch and tartness. Finally, I was surprised to discover that hazelnuts were the nut of choice for this meal, something I have not tasted anywhere else which is a shame because it turns out that hazelnuts are great. To be honest, the only thing that was wrong with the Old Paper Shop Deli muesli was that it seemed served in gourmet (read: small) portions but that could have been a misperception induced by those nefarious endorphins. Overall: Run to this muesli. I sort of did and it was amazing. I will be coming back here for the cakes also, but you will have to leave my eventual thoughts on those to your imagination as this is a muesli blog.